Laser marking is the practice of using lasers to engrave or mark an object. The technique does not involve the use of inks, nor does it involve tool bits which contact the engraving surface and wear out. Laser processing does not have direct contact with the work piece, so does not cause any mechanical extrusion or stress. It will not alter the physical properties of the materials processed. galvanometer, high performance marking control card and embedded computer into one portable fiber marking machine, compact structure and modern appearance perfectly reflects the laser product miniaturization and portability trend. Compatible software: AutoCAD, CorelDraw, Photoshop etc. 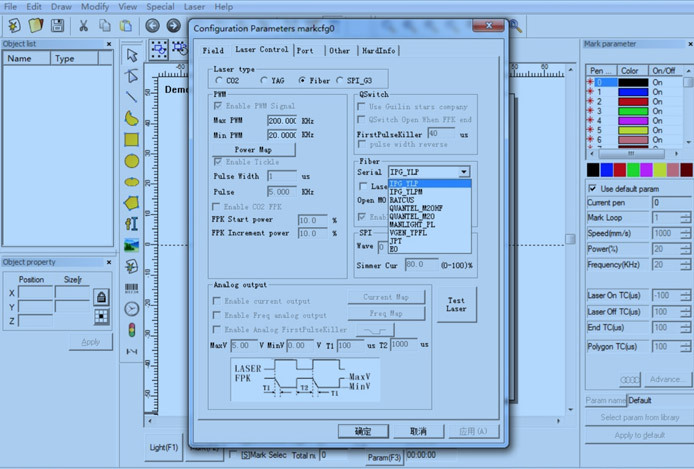 Compatible file format: plt, dxf, ai, dst, bmp, jpg, png, tga etc. Application: bar codes, QR codes, text, graphics and bitmap marking, directly use shx, ttf etc font then automated coding, marking serial number, batch number, date and so on.